The Bank of Canada is expected to raise the policy rate 25 basis points at the July 11 announcement. Economic data has come in roughly as the Bank projected, with growth running around capacity and underlying inflation at 2%. Housing slowed this year, but by design as the government implemented more stringent mortgage requirements. Sales activity appears to have stabilized in part of the county, while starts growth rebound in June to suggest underlying demand remains firm. Real GDP slowed to a 1.3% pace in Q1, matching the Bank’s estimates from the April Monetary Policy Report. Meanhwile, the trade report has also been encouraging, with net exports on track to add to Q2 GDP. Export volumes saw an only small decline in May after expanding, monthly, from February to April. Import volumes bounced 1.0% in May after a 2.3% drop in April but 4.7% jump in March. The Bank of Canada also closely follows business investment, and the outlook remains bright for Q2. The June jobs report was the final release ahead of the announcement that had the potential to dent prospects for a rate hike this week. It did not. Indeed, June jobs grew 31.8k after the 7.5k decline in May, overshooting expectations for a smaller gain. While wage growth has taken off, the acceleration this year has been driven by minimum wage hikes. Underlying compensation cost growth appears to be consistent with the BoC’s ongoing view that some slack remains in the labour market. They have also pointed out that a strong labour market draws workers back to the labour market, as we saw in June. Governor Poloz has been clear that rates will move higher if the economy performs as anticipated. As he stated, BoC is not headline driven, in response to a question on the implications of the ongoing tariff implementation and extended NAFTA talks. Granted, the Bank has been clear that they view the trade backdrop as the main source of (elevated) uncertainty , that why they will maintain a cautious, gradual approach to further rate increases. Hence as the economy was running strong ahead of the tariff implementation from the Trump Administration, the overall current level of accommodation is rather generous given the state of the economy. Therefore, further rate hikes remain widely the call past July, with the caveat being that the timing of those hikes is dependent on economic data and international development and hence more uncertain than usual. 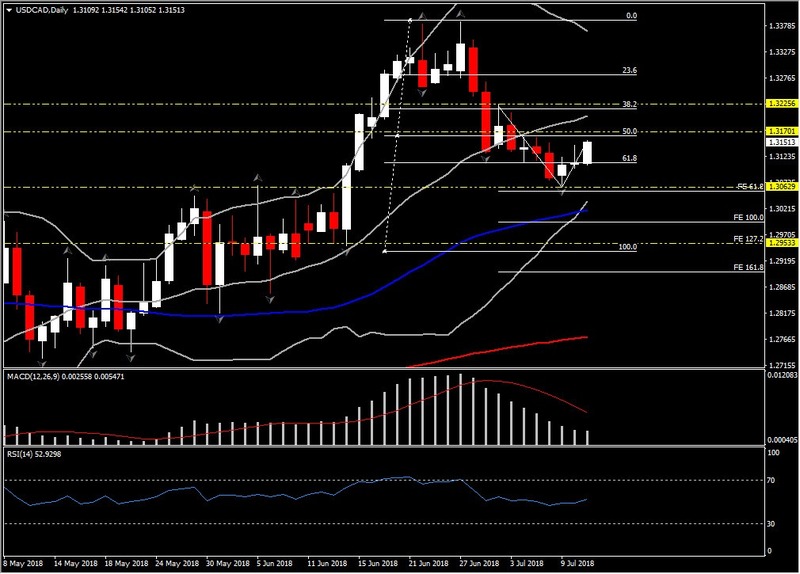 How Canadian Dollar could be affected? So far today, USDCAD rebounded from yesterday’s low at 1.3098, up to 5-days high at 1.3154. The pair has been trading in an uptrend this week, but it did not manage to recover yet, more than 23.6% from the losses identified since June 28. 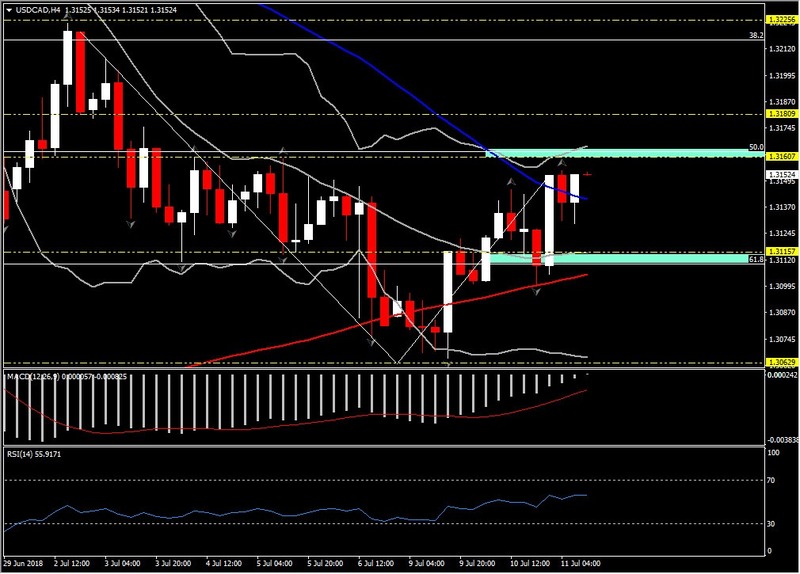 Despite the upside momentum presented by daily momentum indicators, USDCAD remains weak as it is still moving within the lower Bollinger Bands pattern. RSI remains above neutral zone for the last 2 months, while MACD oscillator currently decreases below signal line however it holds within the positive area since April 30. Therefore, if the BoC rate hike as widely expected and Gov. Poloz repeats a more hawkish stance as he did on May 30, USDCAD is likely to drifted lower as Canadian dollar is likely to get stronger. Daily Support comes in at 3-week low at 1.3060, while Resistance set at 1.3225, which is above the 20-Day MA and at the 38.2% Fibonacci retracement from June 14 rise. A break of the long term Support will result a retest of the round 1.2950-1.3000 area (which is between the FE 127.2 and the confluence of the FE 100.00 and 50-Day MA). A break of the Resistance level suggests swing back to June’s highs.